Bonus: leftover tatami bits feed the soil. 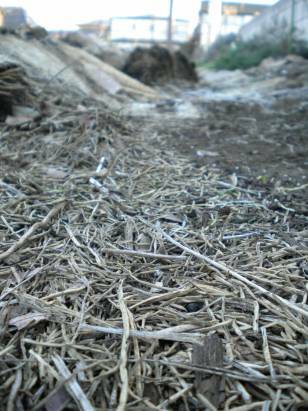 Two years ago I spotted old tatami mats used as mulch at a small neighboring farm. I'd just done a fairly serious weeding session in my little garden after returning from what has now become our annual summer romp in Hokkaido, and was looking for a solution. I am not a fan of weeding, because it usually happens in the heat of the day and because as I learn more about permaculture and organic gardening I see fewer and fewer plants as weeds. Many, like fleabane daisy, offer pollinators and other beneficials important sources of food and shelter, and I'm beginning to think more and more that I need to learn to cooperate. So, one year ago I got brave enough to ask our local tatami master if I could have some old mats. He said yes and a friend helped me haul them to the garden and lay them out between my rows. I still use plastic sheet mulch for the plants themselves as organic matter, like leaves and straw, can be hard to come by at the right time. A solution for that also exists, but I've not discovered the right one for my garden just yet. The mats blocked weeds effectively while letting water soak through, and they staved off some of the erosion that commonly occurs with Tokyo's high winds and heavy rains. They did blow about a bit in the occasional typhoon, but overall they survived quite nicely. When I made my latest lasagna bed - committing a whole long row to what I firmly believe is the best idea ever for building soil vitality - I used the mats to cover the whole of it twice over. (Some mats stayed between the rows, but others had to be taken up when Takashi-san plowed and set the plastic mulch in place.) It helped keep the beds warm so active decomposition could occur, and it again kept things from eroding. The benefit of the mats that I didn't anticipate was their decomposition. As the mats break down the igusa (grass used specifically for making tatami) slips away from the string that previously held it all together. As I pick them up to move them from place to place, the igusa is often left behind as a valuable soil additive. The nylon string is proving something of an annoyance, but I'll just ball it up and bag it with the mint on burnables day. The old tatami themselves, I've decided, will go at the bottom of the compost bin when I turn it in a few weeks time. Or I'll experiment and slip them between layers of turned compost, perhaps, as a different sort of lasagna bed. Oh, the possibilities! Got an experiment in repurposing that worked out well? Even if it didn't that's ok. We've all been there. Let's hear it either way! We use tatami mats in some places, but have stopped because the string is just too annoying when it gets tangled in weeds and branches and what not. We also tried using it as a lid over some no-till beds that we wanted to keep from being compressed by the winter snow. We built boxes around the beds, and laid the tatami over the boxes with still a few centimeters between the tatami and the soil. It worked well and was strong enough under the weight (regular boards just break) but it became so heavy after water-logging all the snow melt, it took me and a friend half a day to drag them all off of the boxes to the side of the garden. They were impossible to carry because too waterlogged. Finally, before you use the tatami you might want to make sure it is not treated with any chemicals. Some of the cheaper tatami mats might be. I wonder how many yoga places use anything but plastic mats. I'll have to keep an eye out for those mats. I wonder if I could plant seeds and use that as a cover until they sprout or if it'd be too heavy? Thanks for the awesome idea. Christina, You should keep an eye out for them, but as Kevin mentions above, you might want to check to see if they mats are pre-treated with any chemicals. Another person I interviewed for an article said he and his wife chose their mats based on the fact that the igusa grower didn't use a chemical known to be harmful to pollinators. As to your question if it would be too heavy for your seeds, my hunch is that yes, it would be. I use old plastic grocery bags to make a quick and dirty greenhouse for sprouting, although a glass bowl would also work. You just need to keep them cozy until they sprout. Kate, I totally understand! But you know, you might want to look into what native species grow in your area and work from there. Why make more work for yourself if you could have a beautiful prairie or other cool planting? Seriously, it will be less work, benefit pollinators, save water and energy, and look awesome! Kevin, Thanks for the good advice. I need to learn how to ask that question in Japanese.